'Eco' comes from the Greek word oikos, which means home. Ecology is the study of the home. Economy is the management of the home. At Eco Teas, we like to think of home on three levels: the body, the household, and the planet. That's why an 'Eco' Tea is healthy, affordable, and sustainable. We started EcoTeas in the year 2000 in the kitchen of our home in Ashland, Oregon. We came together as three best friends with a shared vision: to create a grassroots tea company that supports organic agriculture, fair trade business practices, and healthy living. We work to bring you the highest quality teas at the best possible prices. In addition to providing 'green' livelihoods for our farmers and ourselves, we strive to inspire simple, healthy, sustainable lifestyles. 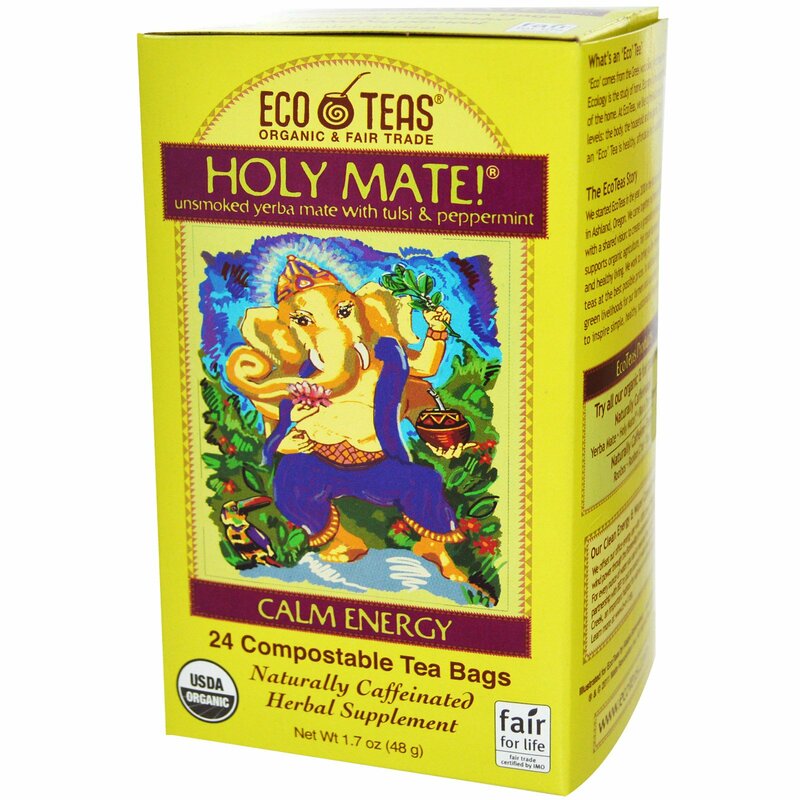 Experience the fusion of two ancient herbal traditions with EcoTeas Holy Mate! tulsi is India's "Queen of all Herbs." Yerba mate is South America's "Gift from the Gods". While tulsi takes the weight off your shoulders, yerba mate puts the spring in your step. We've combined them for a balanced supply of stress-free energy. When brewed as directed, this tea provides an ORAC value of 3,000 µmolTE/240 ml, which is slightly stronger than a typical cup of green tea. Holy Mate! Experience the fusion of two ancient herbal traditions. Tulsi is India's "Queen of all Herbs." Yerba Mate is South America's "Gift from the Gods." While tulsi takes the weight off your shoulders, yerba mate puts the spring in your step. We've combined them for a balanced supply of stress-free energy. Hot: To release the full flavor and benefits of Holy Mate!, steep a tea bag in 185ºF water for 6-8 minutes. Iced: Holy Mate! 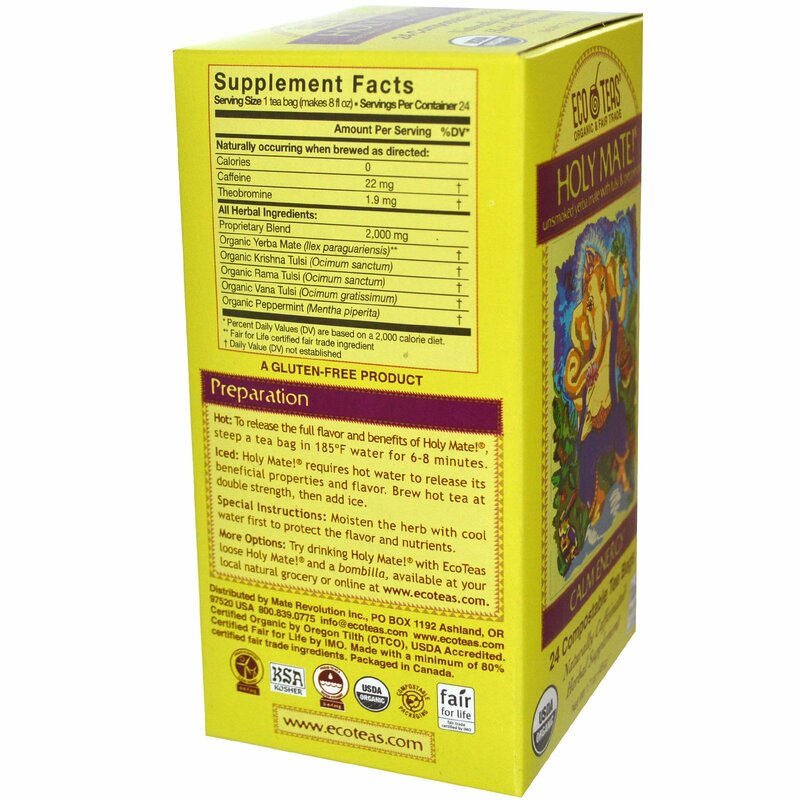 requires hot water to release its beneficial properties and flavor. Brew hot tea at double strength, then add ice. Special Instructions: Moisten the herb with cool water first to protect the flavor and nutrients. More Options: Try drinking Holy Mate! with EcoTeas loose Holy Mate! and a bombilla.